Valentino Rossi and Jorge Lorenzo arrive at the Catalunya track near Barcelona today split by just six-points in what has already been an absorbing battle for the MotoGP World Championship. Six years ago they arrived in Catalunya separated by just five-points in pursuit of early points leader Casey Stoner at a time when their relationship was arguably at its most acrimonious. 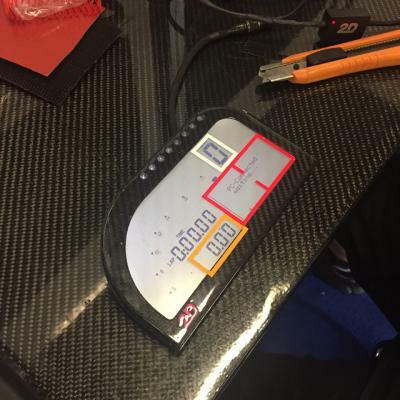 They barely spoke, a wall split them inside the factory Yamaha garage and there was a ban on the sharing of data. 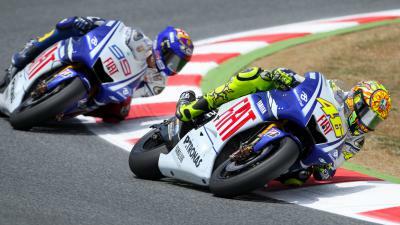 Tension and animosity poisoned the air on a regular basis, but their heart-stopping battle at Catalunya back in 2009 will go down as one of the best final lap shootouts in MotoGP history. This was more than a showdown for 25 points. It was about pride and honour and for those fortunate enough to witness the unforgettable spectacle it will go down as an ‘I was there’ life event. Lorenzo had learnt quickly from a hugely promising but bruising rookie campaign in 2008 to show just why Yamaha had signed him up well in advance of his debut season. 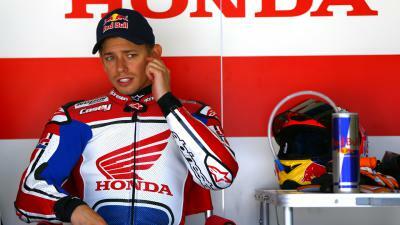 He’d won twice in Japan and France and was looking a serious threat to deny Rossi a ninth title. 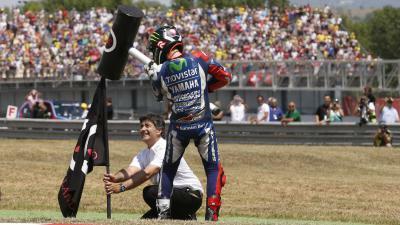 Rossi knew coming to Barcelona that he had to retaliate fast and put his young rival back in his place. 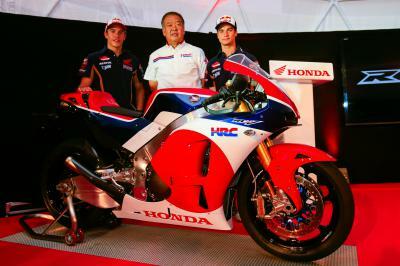 How he did it though has become the stuff of MotoGP legend. The final laps of wheel-to-wheel combat were some of the most dramatic and thrilling you’ll ever witness. And the finale will be forever etched in people’s memory for Rossi’s audacious and daring final corner overtake that shattered Lorenzo’s dreams of a first premier class win on his home track. Rossi used the element of surprise with the move at the final right-hander that was executed with brilliant skill and inventiveness. ‘Clever and brave’ was how Lorenzo described it, as he tried to be magnanimous in the face of what must have been a crushing defeat. I will certainly never forget the media centre erupting in a crescendo of noise that made 150 people crammed inside sound like 150,000. 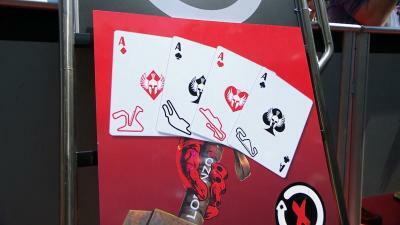 Rossi’s move was so bold that it has not been repeated since. That is largely down to the fact that nobody has dared to be left so vulnerable to an identical attack since. Based on Lorenzo’s recent scintillating form, Rossi will be happy to still be in contention at the final corner on Sunday. After a sketchy start to 2015 where he didn’t even manage a podium in the first three races, Lorenzo has been untouchable in Jerez, Le Mans and Mugello. He’s led 78 laps in succession from start-to-finish and that is a record surpassed only once in the 66-year history of the Championship, when Casey Stoner led 88 successive laps over the line in his dominant 2007 campaign with Ducati. 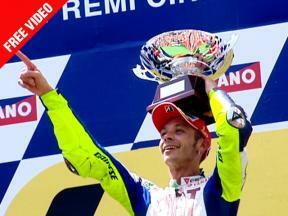 Rossi himself continues to set personal milestones in his quest for a 10th World Championship. His six straight podium finishes is his best start to a season since 2005 and he needs to find a way quickly of halting the Lorenzo bandwagon. Qualifying is the area Rossi has to improve. He’s admitted himself that going gung-ho for one lap in the exciting 15-minute Q2 showdown is a current weakness. Amazingly, he’s only started from the front row of the grid in seven of the last 78 races and has scored only two pole positions since 2009! With Lorenzo a demon starter and peerless once into his rhythm at the front, Rossi surrenders ground that is sometimes impossible to recover. To stop Lorenzo winning a fourth successive race for the first time in his career, Rossi might need to deliver one of his trademark inspirational performances. If he needs any inspiration then he just needs to put this video of his last lap heroics at Catalunya in 2009 on a loop on the laptop in his motorhome. And we would all love to see a repeat of that great battle on Sunday. Valentino Rossi, Jorge Lorenzo, Andrea Iannone, Marc Marquez, Pol Espargaro and Maverick Viñales kick off proceedings in Barcelona. Casey Stoner shares his tips on how to make it as a MotoGP™ test rider in the latest issue of Motorcycle Racer Magazine. A lot of people have been saying I make the Moto3™ races look easy recently… I wish it was easy! Marco Melandri’s aim is to try to stay focused on the task at hand at the Catalan GP despite the rumours surrounding his future. 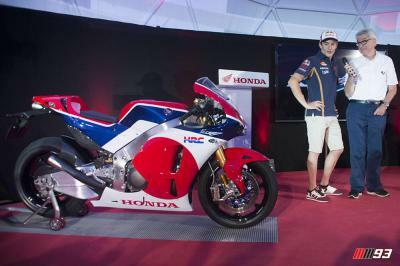 All the best pictures of the new road-going Honda RC213V-S.
Isaac Viñales feels the key to a good performance at the Catalunya GP is finding the right set-up for his bike. 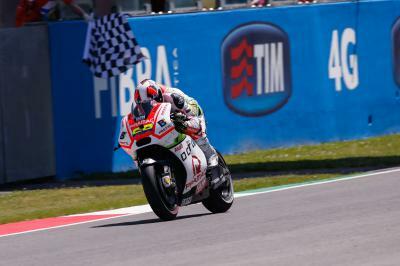 Randy Krummenacher is hoping to carry his race pace from Mugello into the Gran Premi Monster Energy de Catalunya. Yonny Hernandez gives us his evaluation of the season so far in a Q&A before the Gran Premi Monster Energy de Catalunya.